This study was published on Feb 25, 2015. In the world of technology, women are vastly underrepresented. According to data from the U.S. Census, in 2013 women accounted for just 25% of the workforce in computer occupations, a category that includes software developers, programmers, network architects and information research scientists. Historically, tech has been seen as something of a boys-club, and recently some industry leaders, including such companies as Facebook and Google, have promised to address the lack of diversity in their offices. Those promises notwithstanding, women still face an uphill battle in many corners of the tech world. While some tech companies foster an inclusive environment in order to encourage creativity and collaboration–Google famously offers employees delicious free food, in addition to typical benefits like a 401(k) and health insurance–women are too often excluded. So where do women in tech face the fewest obstacles to success? West is not best. While the Bay Area is typically thought of as the tech capital of the world, it boasts only one of the top ten cities for women in tech. Three of the top ten are on the east coast, three are in the south and two are in the Midwest. San Francisco, where women account for just 21% of the tech workforce, came in 23rd. Unequal pay. In only two of the 54 cities we considered are women in tech paid the same as or more than men: Kansas City, Missouri and Arlington, Texas. On average, we found that women in tech in the US are paid 86% percent as much as men. The gap is growing. While the number of women in tech grew by 4.7% from 2010 to 2013 (from 854,000 to 895,000), the number of men in tech over that same period of time grew by 7.7%, to over 2.6 million. Men made up at least 60% of the tech workforce in every single city we examined. The city with the highest proportion of women was Washington D.C., where women make up 37% of the tech workforce. In our analysis we only considered cities with at least 200,000 residents, and cities with a large enough tech workforce to have statistically reliable data.2 For the 54 cities that met those criteria, we ranked each one according to the above four factors. Finally, we averaged the four rankings for each city, giving 30% weight to each of the first two factors, and 20% weight to net pay and employment growth, and applied a score from 0-100 based on that average ranking. To score a perfect 100, a city would have to be ranked first in each factor, while a city ranked last in each factor would score a zero. The results, below, are the best cities for women in tech. 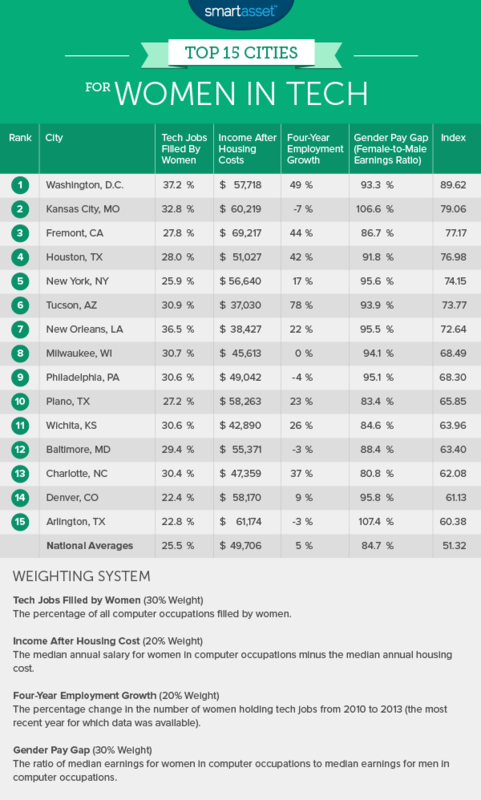 The nation’s capital is the best city for women in tech, and by a fairly large margin. Women in Washington make up over 37% of the tech workforce, higher than in any other city we examined. This is probably due in part to the hiring policies of the federal government, most likely the largest tech employer in the city. While all employers, whether private or public sector, are required to comply by Equal Employment Opportunity laws, the federal government places a special emphasis on making sure that its workforce reflects the population at large. That means more opportunities for women in tech in DC than in other cities, and a better environment overall. In recent years, Kansas City has emerged as a leading city for tech startups, and perhaps the top tech city not on the West Coast or in the Northeast. Women have played an important role in that development, and today Kansas City offers one of the country’s best environments for women in tech. It is one of just two cities in our study in which women in tech face no gender pay gap. Women also make up a relatively high proportion of tech workers in Kansas City, nearly 33% and the third highest of any city in our study. The Bay Area’s lone representative in the top 15 of our index, Fremont sits between San Jose and Oakland on the San Francisco Bay. Income after housing costs for tech-industry women in Fremont is over $69,000, second highest of any city in our study. There has also been especially strong job growth in Fremont for women in tech: from 2,770 in 2010, up to nearly 4,000 in 2013. This is a 44% increase. Houston has long been recognized as one of the most business-friendly cities in the nation, and job growth in the Space City since the Great Recession has been strong. During that time, Houston’s technology sector has seen major growth, and women in Houston’s tech world have particularly benefited. From 2010 to 2013, the number of women employed in tech jobs in Houston grew by 42%, and women now make up 28% of Houston’s tech workforce, well above the national average. Houston was one of just two cities to rank in the top 20 for all four of the factors we considered in our analysis. According to the U.S. Census Bureau, there are nearly 22,000 women in computer occupations in New York City; that’s more than three times the number of women in San Jose’s tech industry, and almost four times the number of women in San Francisco’s tech industry. In fact, no other city in the U.S. has more than 10,000 women employed in computer occupations. Thanks to the sheer size of its tech workforce, the Big Apple offers women resources that other cities do not. Along with the advantages inherent to tech occupations, like high job stability and retirement benefits, a large tech community means women have more opportunities for the networking and meetups that are so important for advancement in the tech world. Tucson’s tech sector is anchored by the University of Arizona and the nearby presence of Davis-Monthan Air Force Base. The largest area employer is Raytheon Missile Systems. The Tucson area has seen especially strong growth in the number of women employed in tech jobs in recent years, from 1,113 in 2010 to nearly 2,000 in 2013, a growth rate of 78%. This is the highest in our study. While New Orleans has one of the smaller tech sectors of the cities we considered, with a total of 2,400 people employed in computer occupations as of 2013 (the most recent year for which data is available), it also presents one of the best environments for women. In fact, at 36.5%, New Orleans’s tech workforce has the second highest percentage of women of any city in our study. Women in the Big Easy make just 4.5% less than men, one third the national average gender pay gap of 15% in computer and mathematical occupations. Wisconsin’s largest city is also one of the nation’s best for women in tech. Women account for over 30% of workers in computer occupations in Milwaukee, 5th highest in the nation, and well above the national average. While many may associate Milwaukee more closely with beer than with high technology, the city is increasingly recognized as a center for tech innovation and growth. In fact, in 2013, the city’s first startup-focused workspace opened up; it now houses over 15 companies, the majority in the tech industry. The ninth best U.S. city for women in tech is Philadelphia. Women fill 30.6% of computer occupations in Philadelphia, 7th highest in the nation. They also face among the smallest gender pay gaps of tech women in any city in the country—women in Philadelphia’s tech sector are paid, on average, 4.9% less than men. In contrast, the gender pay gap for computer occupations in San Jose, one of the nation’s traditional tech capitals, is 13.6%. The second Texan city among the top ten cities for women in tech, Plano is home to the offices of several major tech companies, including CA Technologies, Infosys Ltd and Gearbox Software. The average pay for tech women in Plano is over $74,000, and even after accounting for housing costs, women in tech enjoy an income after housing costs of $58,170, seventh highest in the country. Women make up a larger percentage of the tech workforce in Wichita than in all but five of the cities in our study, with 30% of all tech positions in Wichita held by women. Job growth for women in Wichita’s tech industry has also been strong in recent years, with the number of positions growing by 26% over the four-year period we examined. Baltimore ranks above the national average in three of the four indicators used in our analysis. The average pay after housing costs of $55,371 for women in Baltimore’s tech industry is 13th highest in the country, above historic east coast tech centers like Boston and Raleigh. Job growth for women in Charlotte’s tech sector has been very strong in recent years, with the number of women employed in tech positions increasing from 3,141 in 2010 to 4,317 by the end of 2013. If that trend continues, Charlotte may soon have among the largest communities of tech women in the country. Women currently account for 30.4% of Charlotte’s tech workforce, the ninth highest rate of the cities in our study. While women hold just 22.4% of Denver’s tech positions, they are otherwise doing very well in the Mile High City. Average pay after housing for women in Denver’s tech sector is over $58,000, eighth highest in the country, and Denver’s gender pay gap for tech jobs is just 4.2%, less than a third of the national average. Arlington is one of just two cities in our study in which women face no gender pay gap. In fact, women in Arlington’s tech sector earn over 7% more than their male colleagues. Indeed, the average income after housing costs for tech women in Arlington is over $61,000, fifth highest in the country. Read the 2016 version of SmartAsset’s study of the best cities for women in tech here. 1. The data used in our study comes from the U.S. Census Bureau’s 2013 American Community Survey. 2. Cities with a very small tech workforce have unreliable survey results that may skew the data. If we ignore the possibility of survey error, the top five cities by our methodology would be: Washington, D.C.; Chula Vista, CA; Tacoma, Washington; Detroit, Michigan; and Kansas City, Missouri.